Inspired by the art of John Salsnek and dedicated to his memory. Tsukineko Inks. Quails and Apples, two delights of the South Okanagan. to try creating these amazing flowers. So sorry to say, the blooming period is very short. My photograph taken in a vineyard in Osoyoos B.C. was the inspiration for this Piece. capture the unusual colours of the vines in October. Spotted Lake is one of the Okanagans most unique natural wonders. Deposits of minerals create the unusual spotted effect. threads add interest to the foreground. disappearing from our Canadian Landscape. who devoted his many paintings depicting prairie scenes. Angelina Fibres, Dye-Na-Flow paint for the sky, Tsukineko inks. of a 5 am Sunrise in Montana U.S.A. This is a window shape from a Baptist Church in New Castle Creek NB Canada. song which was a favourite of my Grandparents who attended this Church. Courtyard wall inspired this quilt, West Vancouver B.C. cottages in Scotland inspired this piece. This piece was created with Wool Roving. Needle punched technique. Created for the “Together” Show in La Connor Washington. Beading, Machine and hand Quilted. Created in dyed cotton, velvets, organza. Snow created by Leslie, Tsukineko inks. A quiet morning in Murano. An April trip to Kukenhoff Gardens in Amsterdam inspired this piece. for leaves. Needle turned hand applique, thread sketched by Machine. quilt dyed by Leslie, no commercial fabrics. hand painted fabrics Machine pieced and quilted. Created for the Cherry Blossom Festival in West Vancouver B.C. Ice dyed cotton and silk for background, immersion dyed cotton for the Muskoka Chairs. Created after a family reunion on this lovely Lake. Needle Felted background of Wool and Silk Roving. Background panels created with commercial fabrics. one of which was overdyed. and I was not dying and painting fabric at this time. 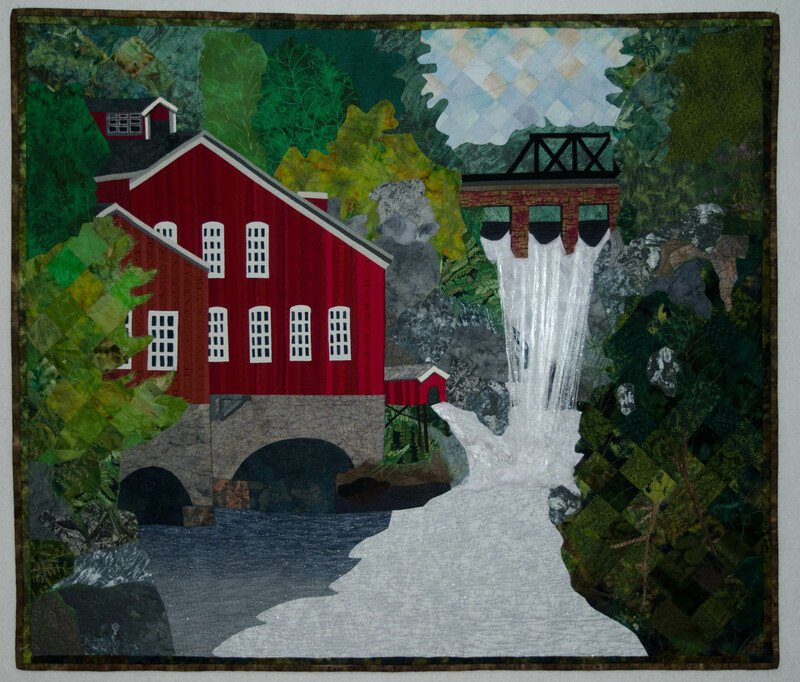 was published so I did not continue my series of quilts. These three are all from the “Basilica di San Marco” in Venice Italy. Reverse applique, satin stitched grout lines. Machine and hand applique. Machine quilted. bleached. Machine and hand applique. Medallion and Border from the San Niccolo di Tolentini Church. painted fabric by Jack Bishop. Machine Quilted with many metallic threads. A traditional pattern explored with all sequenced fabric dyed by Jack Bishop. Centers of the blocks are hand dyed fabric as well. Exploring the Montana Cartwheel Block in an original setting. Sound Interruption – One Moment Please! An original design using a curved weaving technique. The woven cotton fabric is overlayed with a tucked organza. A study using Batiks combining Montana Cartwheel Block and Stars. This is an exploration of colour movement on the diagonal using commercial fabrics. Each square is created with a flip and sew method and joined with bias cut fabric. Dragon Fly wings created with iridescent painted fabric by Jack Bishop. Flower center is beeded and the eyes are raised with padded sequins.